It seems as if we’ve been waiting for the first Android Ice Cream Sandwich phone for eternity, but at long last the Samsung Galaxy Nexus has arrived. At a press event held Wednesday morning in Hong Kong (Tuesday night in the United States), Samsung and Google revealed the first phone with Google’s next-generation operating system, Android 4.0. 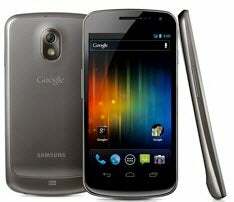 Like the Samsung Nexus S, the Android Gingerbread flagship phone, the Galaxy Nexus has a curved, contoured glass display. The idea is that the phone better fits the shape of the user's hand, making for improved ergonomics. The Super AMOLED Plus display is rather large at 4.65 inches, with a 1280-by-720-pixel resolution. This is the same display technology we’ve seen on Samsung's Galaxy S II series of phones and on the Mototola Droid Charge. The T-Mobile version of the Galaxy S II, with its 4.5-inch screen, felt slightly too large for my hands, and text looked a bit on the fuzzy side. From what we saw, however, the Galaxy Nexus might not feel oversize, despite the larger display. The bezel around the phone is incredibly thin at only 4.29mm, so you get mostly display and very little bezel. The Galaxy Nexus will come in both HSPA+ and LTE flavors. The only confirmed carrier so far is Japan’s DoCoMo. The Galaxy Nexus is powered by a 1.2GHz dual-core processor, making for one heck of a powerful, fast phone. The Nexus has both a 5-megapixel rear-facing camera and a 1.3-megapixel front-facing camera. According to Samsung, the Galaxy Nexus also boasts zero shutter lag, meaning that it has no delay between when you press the shutter button and when the camera actually processes the photo. Other features include near-field communication as well as a barometer. When Google first announced Ice Cream Sandwich at its Google I/O developer conference in May, the company placed a lot of emphasis on NFC technology. With it, you can exchange contact information, make mobile payments, play games, and do other tasks. Pricing for the Galaxy Nexus has not yet been announced. The Galaxy Nexus will launch in November in the United States, Europe, and Asia--and we can’t wait to get our hands on it. The LTE speeds dazzle, the AMOLED display shines, and you get a free mobile hotspot at least for a little while. What’s not to like? Well, the battery life disappoints, but that may not be enough to spoil the fun. Google and Samsung's joint collaboration nicely showcases the latest version of Android, Gingerbread, but the Nexus S has a few hardware oversights.